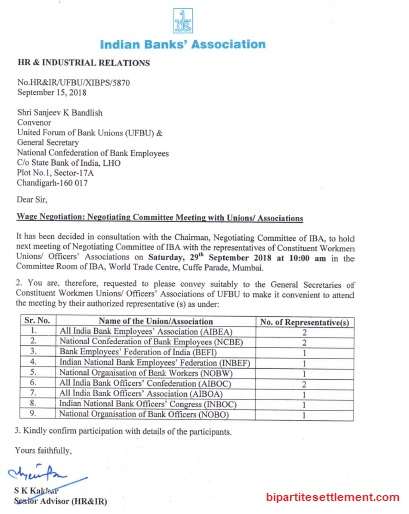 It has been decided in consultation with the Chairman, Negotiating Committee of IBA to hold next meeting of Negotiating Committee of IBA with the representatives of Constitute & Workmen Unions/ Officers’ Associations on Saturday, 29th September 2018 at 10:00 am in the Committee Room of IBA, World Trade Centre, Cuffe Parade, Mumbai. 3. Kindly confirm participation with details of the participants.